When it comes to debt, there are two terms that will often come up: insolvency and bankruptcy. While these two terms are related, they each have their own separate meanings. 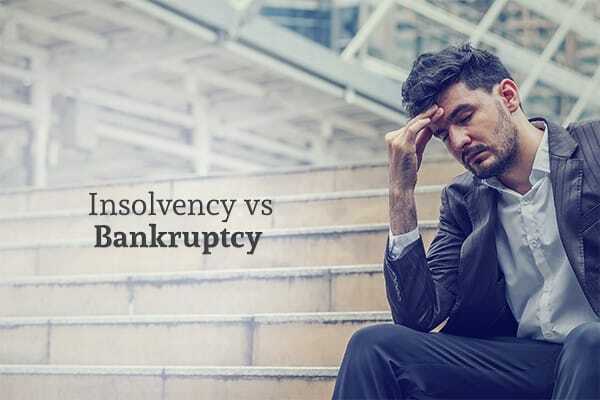 Essentially, insolvency means that a person or business has more debt than assets, whereas bankruptcy is a formal declaration that they can’t pay those debts off and are seeking relief from the debts. Read on to learn more about insolvency and how it relates to bankruptcy. Insolvency occurs when a person or business doesn’t have enough cash or assets to cover their debts, often leading to a failure to pay off bills on time. Being insolvent does not necessarily mean that you have to declare bankruptcy, however. If you believe that you’ll be able to work off your debt on your own, you can petition for an insolvency order so that you’re not forced to declare bankruptcy too early. Insolvency for individuals and businesses is similar, but does have some differences. Balance sheet insolvency – means that a company’s debt is greater than the total worth of their assets. It is possible for a company to fall into one category of insolvency but not the other. If the company doesn’t make enough money to cover their bills and debts, but they have more assets than debt, they are cash flow insolvent but not balance sheet insolvent. In this case, the company would likely have to start selling off assets (such as stocks, vehicles, equipment, etc.) to avoid having to declare business bankruptcy. On the other hand, a company may be balance sheet insolvent but not cash flow insolvent if they have more debt than assets, but they have enough cash influx to pay their bills on time. It’s not uncommon for businesses that are balance sheet insolvent but not cash flow insolvent to continue running for a while. For an individual, there’s no such thing as balance sheet insolvency, since a negative balance would essentially be the same as an inability to pay off your debts. Technically, a person is not considered insolvent unless the sum of their debts is greater than the sum of their assets. The main consideration when it comes to personal insolvency is whether or not the individual is able to pay off their debts in time. When should an Insolvent Person/Business Declare Bankruptcy? If your household income is less than your debts, and you don’t see a way to change that in the near future, it’s likely time to declare bankruptcy. Even if you’re holding certain assets – such as a car, a home or retirement savings – selling them would only be a temporary fix; declaring bankruptcy is often the better option. You should declare bankruptcy sooner rather than later so that creditors don’t start repossessing your belongings. Insolvent business owners often have a longer time before they have to declare bankruptcy. However, if things don’t turn around soon, it’s likely time to declare business bankruptcy. Furthermore, a business that is both cash and balance sheet insolvent will likely be unable to avoid bankruptcy. If you or your company is insolvent, consult with the attorneys at Machi & Associates to determine if it’s time to declare bankruptcy. Their experienced bankruptcy lawyers will go over your options with you and help you figure out the best option for paying off your debts. Contact them today to schedule your free consultation.